Fot those not familiar with the Putumaya Series of World Music I should explain that this album is but one of many. There are Putumaya albums for virtually every type of music, and I have them all, courtesy of my local Public Library. As a matter of fact, these CD's represent world music in such a way that even the Mooresville Public Library, which does not have CD's, has these CD's. They are, literally, that valid, almost as much so as literature. 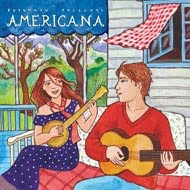 This album, "Americana", draws on every genre of American music, from the jazzy sound of Nora Roberts singing with The Little Willies, to the gospel sound of Terri Hendrix ,all the sounds of American music are on display. The playlist may contain some names you have not heard before, such as The Little Willies, but these are the sounds that really drive the creativity of today's musicians. It's interesting to note that many of the progressive sounds we listen to in music are derived from the basic folk and bluegrass scenes, with a touch of jazz thrown in.And when it's all lumped together it becomes a uniquely American sound.